Like a year ago we started Trans Germany in a chilly and grey weather. Luckily it stopped raining just in time for the start, but the heavy rain had made the the course very slow. I had the feeling the tires was sucked into the ground. So it was pure power pedaling today. We started with a climb, what is good. Less hectic, less chaos, because you either can climb or you can not. I went full blast from the beginning, but somehow I had the feeling the pedalling was not poweful enough. Almost on top of the first climb I saw Suisse rider Milena Landtwing. I remained calm, there was a lot of climbing and riding time left. I was hoping she was overdoing it a bit and would have to ay for it later. We hit the second climb and I went my own pace. Dropped the riders who I was riding with and caught up to another group. This was just he right group to sit in. Climbing was fast enough and the downhills were ridden safely. I must admit that my descending on theese gravel roads are not something I like. We also passed Schnitzertaler Alp where I crashed a year ago. It was quite emotional to pass the place where I was lying a year ago surrounded by the rescue team and waiting for a helicopter transport to the hospital. I finished the stage in a safe way and will wear the leader’s jersey in tomorrow’s stage. 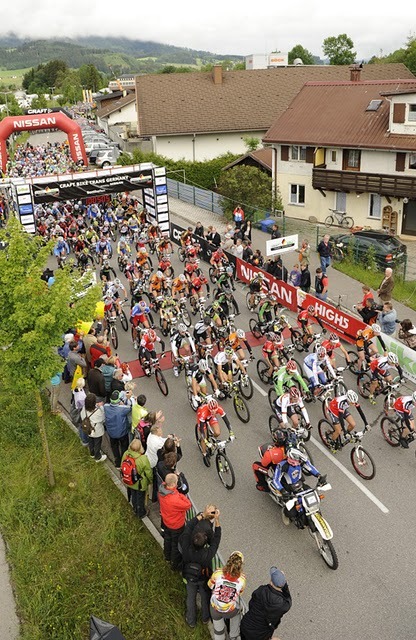 There are still another 3 days to come and as you know a lot can happen in a mtb stage race. I will keep to my tactics, ride hard but safely and not take any risks.